I just adore shooting wedding receptions at the LeMont! It has such a classic, classy look and of course an outstanding view of downtown Pittsburgh. When its time to get your night time portraits, you are just steps from a few Mount Washington overlooks. You can get the city glowing behind you in the distance. Your guests will love the views too. 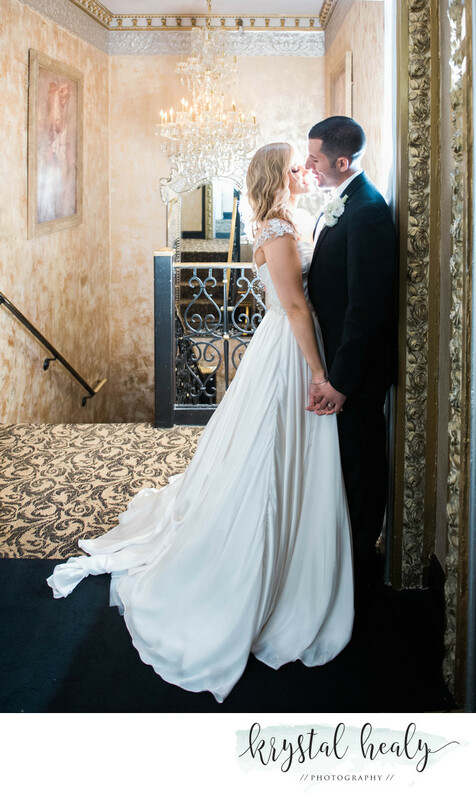 Weddings at the LeMont are what you have dreamed about, especially if you have grown up in Pittsburgh! In this photo it happened to be pouring when it came time to do our nighttime photos outside - so we improvised. Luckily the LeMont is gorgeous and provided us with a great rain plan. We used the stairwell with the beautiful chandelier and off camera flash. We managed to get some great portraits just steps away from the couples reception and had them back in the room to party within ten minutes! End of the night shots are a must have! Location: The LeMont, Pittsburgh, PA 15211.